May | 2013 | What the blackbird said. My friend died, and I have never felt more alone in this enormous city. I’m not very good at feelings. I try my best to pretend I have none and people tease me for my inability to cry, but one phone-call just shocked the tears straight out of me. I arrived back in London an hour ago and as soon as I plugged my phone in it began to ring. My heart sank immediately; my aunt in America is really ill and nobody answered when we called yesterday, so I braced myself and picked up. As it turns out, bracing yourself for bad news doesn’t work if it’s not the bad news you were expecting. It doesn’t feel real, and I’m vaguely aware that this is shock not grief. That makes me feel better about the crying thing. I only spoke to her on Thursday. She’s been ill for a long time but she said she was feeling better than she had for months. I didn’t see her when I was at home for the weekend because she was on holiday. I won’t see her next time I go home because her husband came back from that holiday alone this morning. It doesn’t feel real. I’m not sure what to do next. There’s only one person in the whole of London who I can really talk to, but to do that I have to tell him, and he loved her too. He’s in work. I’m sat in my little yellow box wishing that this wasn’t real. It is real. She died. I want to tell you how wonderful she was, my brave, clever, funny friend, but I don’t know how to. She would know. Maybe another day I’ll sit down at my desk again and write something that does justice to her brilliance. If I manage that, it will only be because once upon a time she taught me how to. Right now, though, she isn’t here. It doesn’t really feel like I am either. 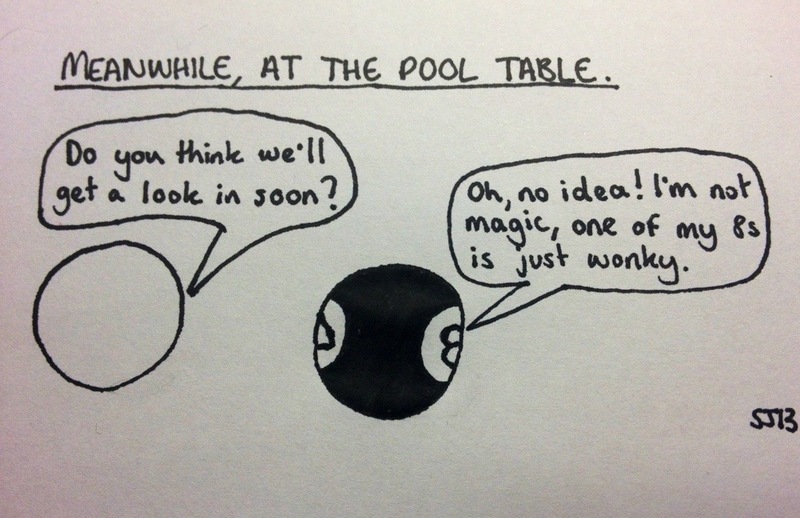 Meanwhile, at the pool table.